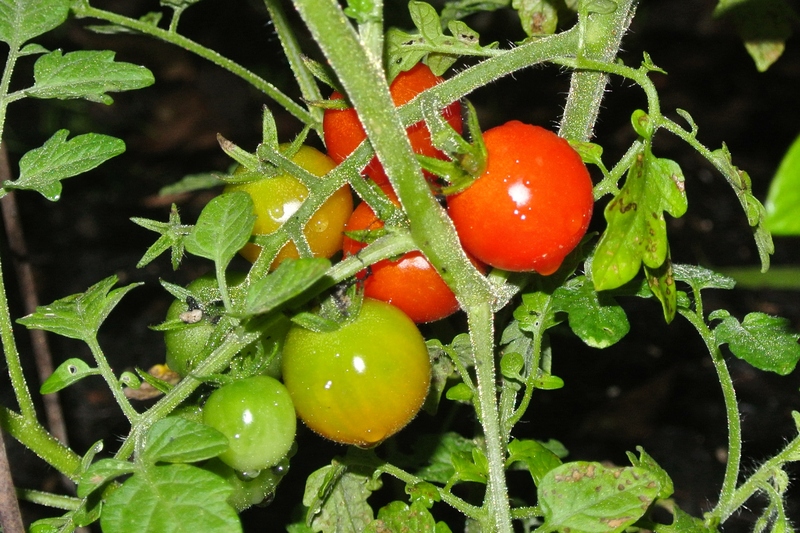 May 10th 2013 I picked the season’s first red, ripe and redolent of traditional flavor – tomatoes – yes plural form of the word tomato, more than one – Yee Haw cowboy! The Sweet Million variety is the first to deliver the goods. My Celebrity plant will not be too far behind. My mouth will just have to wait a little longer to savor a BLT with one of MY red, ripe and redolent of traditional flavor – real tomatoes. I will have to admit that I am not so optimistic with my Mortgage Lifter tomatoes – at least so far this season. I have had blossoms, I put my bumblebee suit on and buzzed the flowers with the electric toothbrush but the blossoms close up and drop off! Another update – I have my wife to thank for having tomatoes to pick today….she was tempted yesterday…thank goodness they weren’t apples or margaritas! 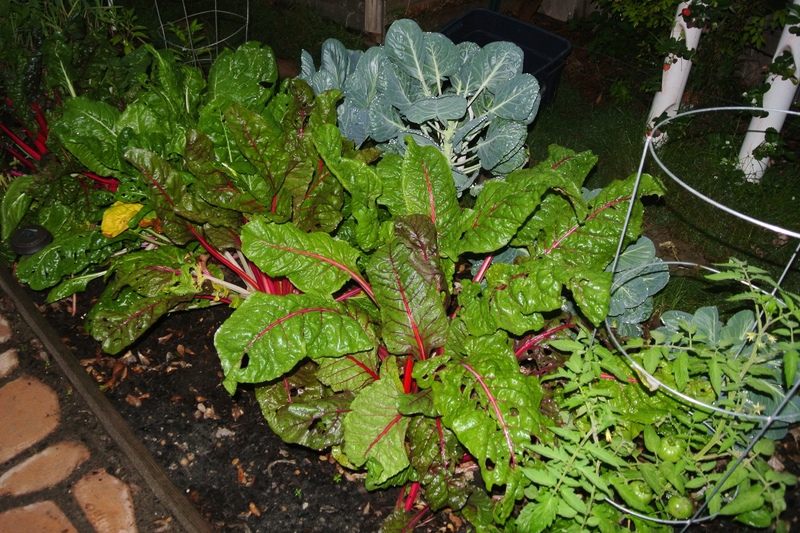 (see- https://bishopsbackyardfarm.com/2012/10/02/a-vibrating-garden-visitor/ ) I also planted some grafted heirloom varieties purchased from Burpee so maybe I will have some better luck! The May 10th tomatoes picked in the dark. Dark at 10:30 AM. Yes AM – today’s storm is very dark. 4 inches per hour of rain heading our way! The asparagus bed gets better each year…I think it is on year 5 for the oldest root crowns. Sometimes the spears never make the kitchen……they are so good freshly cut! Last night I snacked on a few after my return from McAllen Texas, down in the Rio Grande River valley. I also savored a few Alpine strawberries and a few full sized berries off of my strawberry towers. The white Pineberries seem to be busy sending out runners…..I may have to snip that behavior and try to force it until later this summer. Finger sized asparagus spear….flash photograph at 10:30 AM!!!!! My friend John and I have cucumber seeds in the ground ready to start up the trellis. He is a bit more limited with space so he is only growing a slicing variety. Me, on the other hand have slicers, Armenian long style and “picklers” planted in my beds. I will promise my family….no more attempts at making dill pickle. I can’t compete with your favorites! So, sweet or bread and butter types will be my focus. Several years ago I made a spicy, mildly hot bread and butter recipe….I liked it! If I remember I will share that recipe later on this summer. I am pleasantly surprised, my quiet strawberry beds, resting after an early spring burst of activity, are showing lots of blossoms….again, Yee Haw cowboy! I really don’t think a person can have too may strawberries! The arches over the garden entry I built with Crepe Myrtle pruning’s are supporting several varieties of pole beans. The blossoms are heavy on some of the supports indicating a potentially bountiful harvest. Once the vines are filled in a little better I will share a photo. I have a mix of red, purple and white pole bean blossoms showing. Fingers crossed that the vision in my head is reflected in the end result of the planting. 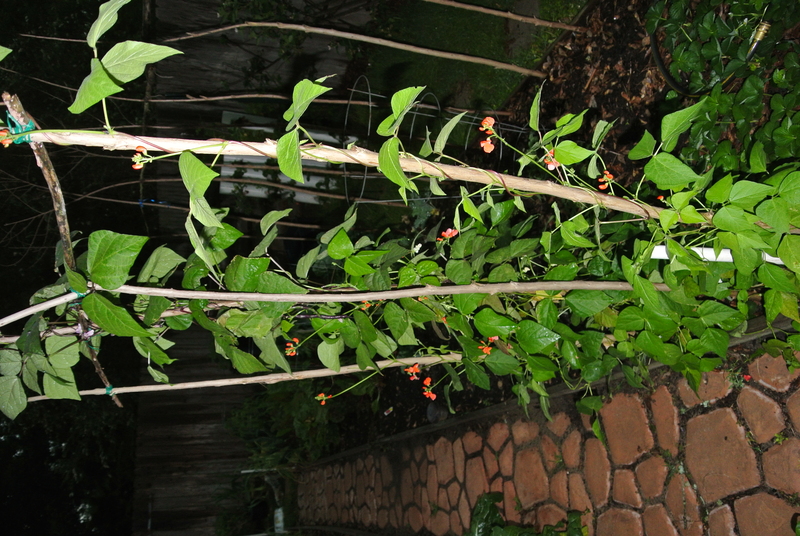 The pole bean arches with some red blossoms. My Dwarf Meyer Lemon tree has set a good number of lemons, some are approaching egg size right now. What is interesting though is that there is evidence of many new blossom forming on the tree now. Not sure if this is in the realm of normal behavior but I won’t look a gift horse in the mouth….I will certainly take and enjoy any extra efforts by my little lemon tree! Weather update….nearly 2000 lightning strike per hour in some areas just east of Houston. Flooding, hail and dark, dark skies! we are bracing for some very wet weather. Hope you have better luck with your bean fantasy than I. Last year I wanted to grow my own Bean Salad, so I planted green, yellow and purple beans at the same time. They all grew and flourished. Sadly, they did not bear and mature concurrently, but consecutively. Which meant I had to pick, blanch, and freeze the early ones till the later ones caught up. Not the fun and instant gratification I was hoping for. I may be looking at the same gaps in what is ready…..Those with the red blossoms are well ahead of the rest. Oh well, I will still enjoy the bounty! What a beautiful garden. 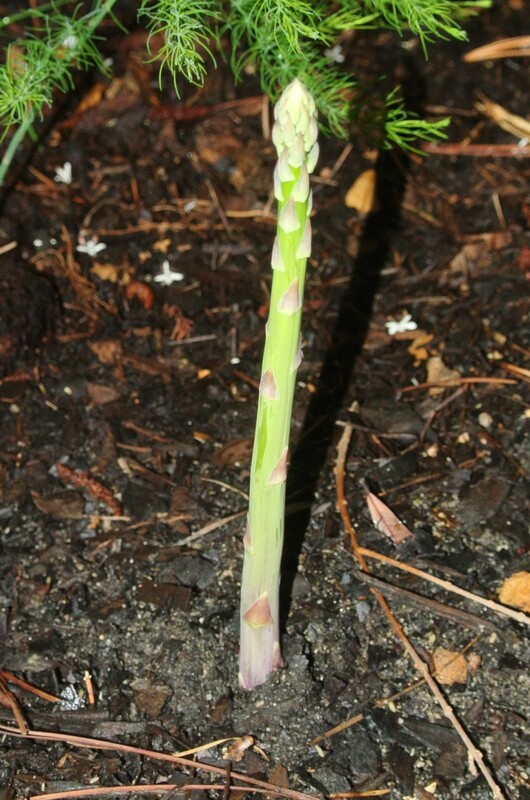 I love the newly emerging asparagus! Nothing better than freshly picked! Thank you….and freshly picked asparagus is so sweet….just amazing!